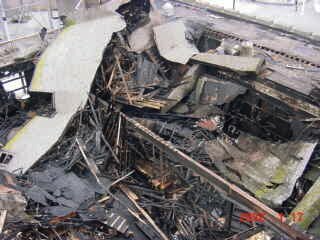 A long standing icon on the Wildwood Pier is nothing but ashes and memories now. Castle Dracula fell victim to that scourge of darkrides - Fire. 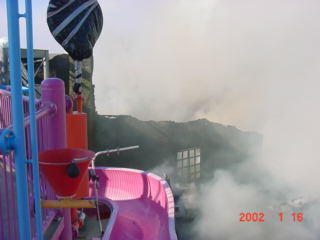 A policeman reported the fire shortly after it started about 10:30 AM Wednesday, January 16, 2002. 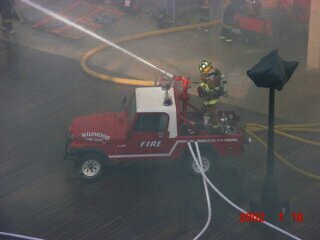 Over 100 firefighters from 6 communities battled the blaze and had it under control around noon. The last glowing remnants of the fire were extinguished by 2 PM Thursday. It is very ironic that this very structure survived a devastating fire that destroyed the rest of the pier in 1992. 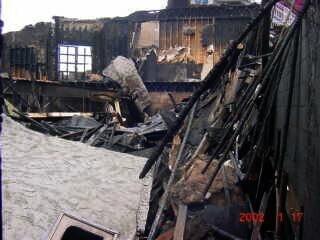 This time it was the only building destroyed by the fire. 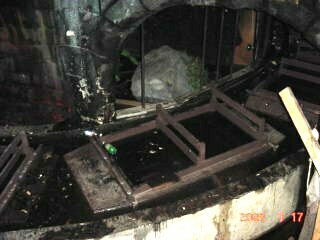 This well-known water darkride and walkthrough attraction started life as an Old Mill ride in the 1930's. 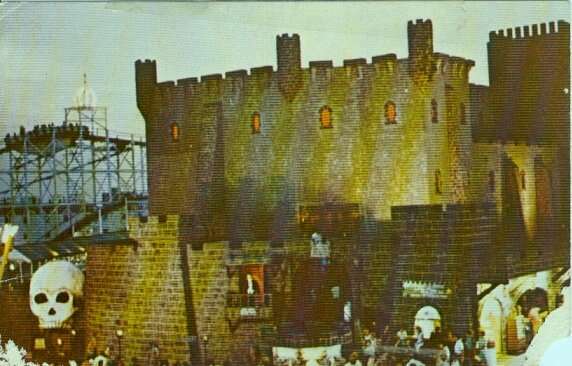 The Nickels family converted the Tunnel Of Love into the four story Dracula's Castle in 1976. Legend has it that some former Disney designers created a few of the props in the ride. 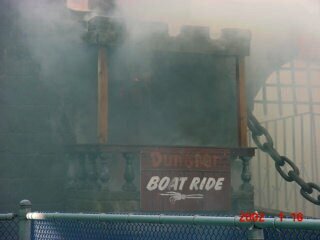 The unique boat ride and walkthrough combination included about 30 live actors and was styled to look like the "real" Dracula's Castle in Transylvania. Since the utilities were off in the building and no work was being done, the cause of the fire quickly pointed to arson. 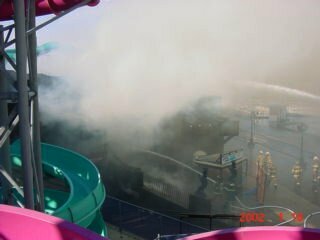 Shortly after the blaze started, police had a 15 year old and 16 old boy in custody, reportedly as they ran out of the front gates of the attraction. Both were charged with arson, burglary, and criminal mischief and are currently under "in-house detention. I.E. wearing electronic monitoring devices around their ankles on a 24-hour basis at their homes. Needless to say the Nickels family is devastated by the loss of the attraction. A reported 3 million people have seen the attraction in its lifetime. 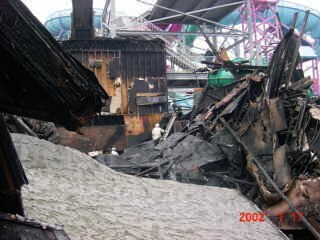 Initially, Nickels said that it was unlikely that it would be rebuilt, but a recent report suggests that due to the response of the ride's fans, they are reconsidering, possibly by opening a temporary, single story structure as early as this summer. Construction of a new castle could take as long as 1 1/2 years and cost $5 million to $8 million. 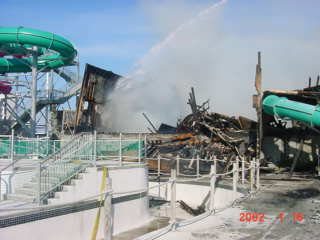 Since 2000, the attraction had been leased to Splash Zone. 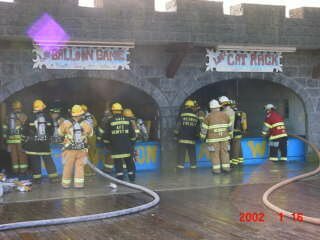 Thanks to Dave Hewitt for these photos taken during the fire and to Scott Silar for providing news accounts of the fire. This article ©2002 Rick Davis and used with permission. Special thanks to Scott Silar. Photos ©2002 Dave Hewitt, and used with permission.